You won't believe the mountain views! This home and suite are just right for you, dog friendly, hot tub, 2 kitchens, garage and lots of room! Palisades Paradise and Happy Hideaway are the perfect fit for larger gatherings of family and friends. These can be rented together or separately. The mountain views don't get any better! The setting is four miles west of Red Lodge just outside of town but close enough to be convenient. 15-20 minutes to the ski area and 7 minutes to town. Soaking in the hot tub and gazing at the stars is a favorite! Dog's are welcome too. Palisades Paradise-This home has 4 bedrooms downstairs (one bedroom has a king bed, 2 bedrooms have a queen bed in each, one bedroom has a twin bed). There is one full bath downstairs. The main level of this home has a large open kitchen/living area with a full bath. There is a large loft upstairs with queen bed, a double bed and 2 twin beds. 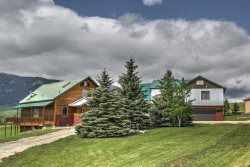 There is a large deck on the west side of this home over looking the mountains and beautiful scenery. You have a propane BBQ, washer and dryer too. Happy Hideaway-This newly constructed suite is located above the garage. It has 2 bedrooms each one having a queen and twin bed. It has a well stocked kitchen, bath, and living area. The couch has a queen sized sofa bed. Renting Happy Hideaway, you will have the perfect balcony to sit, relax and sip on a morning cup of coffee. There is a charcoal BBQ ready for your use along with a washer and dryer. Beautiful view of the Red Lodge Mountain and the runs we spent the day skiing. Snow was cleared promptly from the driveway and private roads. Heed the advice of driving only a four wheel drive vehicle to this property.